Uglyworld #385 - Charging The Monaro Battery (71-365), originally uploaded by www.bazpics.com. My UK car is due it's MOT (annual test of emissions and car's general condition) so it's time to get it's battery charged up after it lying unused during the winter months (as it's as much use as a chocolate fireguard in the snow we get during the Winter in Germany). As I was heading out to the garage to remove the battery Jeero asked if he could come out and see how this was done, so of course I agreed (secretly I'm hoping he will grow up to be a mechanical engineer and can take over the job of fixing things from me). Once we had the battery out of the car and back into the house we started to connect it up to the battery charger to breath some life back into it, Jeero asked how long it would take to be ready to use again to which I said 24-48hrs to be back 100% fighting fit. 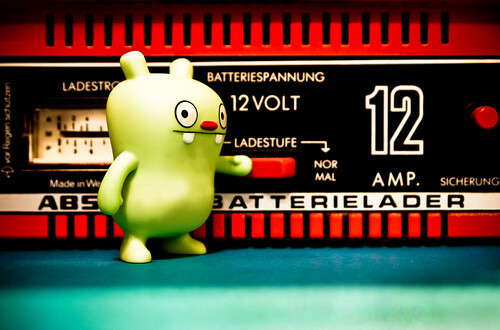 Jeero decided that this was too long and by his own accord he turned on one of the switches on the front panel of the charger, I heard the "click" of the switch changing position and asked him what he did. Jeero replied, "I see'd that there was a button which I thinks means slow or fast, so I wants it to be done quickers so we can has fun in the car agains, so I presses the fast button". Gotta give him 10 out of 10 for ingenuity, just hope he doesn't fry the battery!! !